Old doctor putting on blue medical mask. Doctor wear mask in blurred background. Face mask putting on. Mature doctor put on medical mask before operation. Put on surgical mask using both hands. 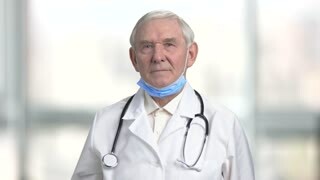 Portrait of old grayhaired doctor putting on medical mask in bright blurred room background.